Labeling for all items - cues, subs, groups, dimmers, fixtures, attributes, etc., with or without alpha keyboard. Offline Version for creating shows away from the console. Win95/98/ME/XP/2000 and Vista compatible. The Rendition Series consoles provide classic theater control from two-scene manual to full memory control with multiple cue lists. 24/48 and 48/96 two-scene control models are available with up to 1536 memory channels in 125, 250, and 512 channel configurations plus 1024 ML channels. The consoles have two playback pairs, 24 submasters, trackball control, and includes full moving light control capability with 16-bit fades, LTP, focus presets, color picker, predefined ranges, automatic fixture groups, fixture library, and built-in fixture editor. Rendtition has Ethernet support for 2048 outputs using ArtNet, PathPort, or BSR E1.31 ACN Streaming protocols. Additional Ethernet support includes remote video/control and wireless focus remote on PocketPC. Rendition supports Cast Lighting's WYSIWYG Perform and Perform CE with features for visualization, AutoPatch, and AutoFocus control from WYSIWYG. The console has a graphical user interface with keyboard and mouse point and click operation. Inside the console is an industrial processor with powerful Intel core and reliable Flash-based hard drive for operating system and on-board show storage. USB flash key support is provided for show backup and software updates. The series features an offline version for WindowsXP which when run with WYSIWYG provides full offline pre-cue of a show. 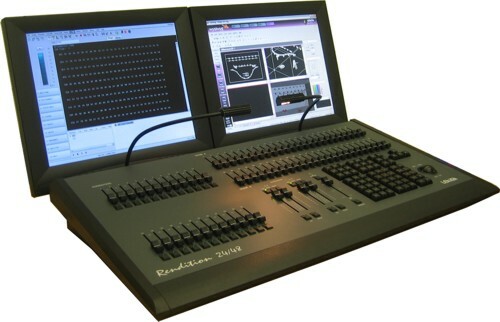 The Rendition is a sophisticated and versatile console that meets the lighting control needs from school productions to the professional stage - for a new generation of light board operators. Copyright � 1998-2007 Lehigh Electric Products Co.